Using oils on skin isn’t a new concept—it’s been practiced for thousands of years—but modern-day research on plant oils has revealed fascinating insights into how some of them work and what they contain that gives such beautiful results. Paula’s Choice Skincare has examined the most compelling research on the best oils for skin and has the details (plus product recommendations) on 10 non-fragrant oils we find fascinating. Once you see the difference these oils make on dry, flaky, dehydrated skin, we’re confident you’ll find them just as intriguing. Note: All of the plant oils we describe below are suitable for sensitive skin, even skin prone to rosacea. Sunflower oil comes from the seeds of the colorful sunflower plant. It’s a rich source of the fatty acid linoleic acid as well as oleic and palmitic acids. The fatty acids in sunflower oil are naturally attracted to other lipids (fats) that make up skin’s barrier. Their compatibility with these lipids makes them a welcome relief for dry, compromised skin. Sunflower oil is great for anyone experiencing mild to moderate dry or uncomfortable skin. It works well with other oils and emollients, and is often included in face and body moisturizers. Sunflower oil’s benefits include smoother, softer, and more resilient skin. You’ll find sunflower oil in select Paula’s Choice Skincare products, including Moisture Renewal Oil Booster, SKIN BALANCING Oil-Reducing Cleanser, and RESIST Perfectly Balanced Foaming Cleanser. Coconut oil is the oil expressed from the meat of the coconut fruit. It’s a rich source of saturated fats, including medium-chain triglycerides, which can be advantageous for very dry skin. The fatty acids in coconut oil offer intense smoothing and calming benefits for skin. Coconut oil and its constituents also serve as the starting point for many cleansing agents that you’ll find in facial cleansers, body washes, and shampoos. Coconut oil is best for dry to very dry skin. Its naturally oily feel and saturated fats work beautifully to prevent moisture loss and restore a supple feeling. Remarkably smoother, softer, and supple skin that, when combined with other emollients, helps skin resist moisture loss for several hours. You’ll find coconut oil in Paula’s Choice Skincare CLINICAL Ultra-Rich Moisturizer and RESIST Anti-Aging Lip Gloss SPF 40. 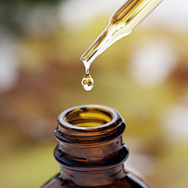 Jojoba oil is the oil expressed from the seeds of the shrub-like jojoba plant. It’s a non-fragrant source of several fatty acids, many of which are lighter in texture than the saturated fats found in some other oils. Jojoba oil can be used by all skin types. Jojoba oil is a star ingredient (among other non-fragrant oils) in our Moisture Renewal Oil Booster. It’s also a key ingredient in our RESIST Intensive Repair Cream. The eicosenoic acid in meadowfoam seed oil, along with its other components, work together as a smooth yet non-greasy emollient that soothes and softens skin. Meadowfoam seed oil’s emollient properties also help give a “cushiony” feel to products. All skin types experiencing dryness will benefit from this effective plant oil. One of the most remarkable things about meadowfoam seed oil is how soft it makes skin feel, leaving a protective veil of moisture that makes it an excellent addition to cleansers. In fact, you’ll find meadowfoam seed oil in our Perfect Cleansing Oil. This non-fragrant, lightweight plant oil comes from grape seeds, typically those that are by-products of winemaking. Its very low saturated fat content gives this oil a lightweight, fluid texture. Grape seed oil has a high content of vitamin E, one of the reasons it’s such a good antioxidant. It also contains several phenolic antioxidants (like resveratrol). Grape seed oil’s benefits apply to all skin types, but its lighter texture makes it especially great for normal to slightly dry skin or dry areas of combination skin. Like most plant oils, grape seed oil delivers smoother, softer, more radiant skin. Its antioxidant content strengthens skin’s resilience to pollution and other environmental nasties. Grape seed oil is a key player in our EARTH SOURCED Antioxidant-Enriched Natural Moisturizer. It’s also another gentle, non-fragrant oil we include in our Perfect Cleansing Oil. Rosehip oil is a non-fragrant plant oil derived from the hip and seed portion of various types of rose plants. Because the flower portion isn’t used, rosehip oil doesn’t have the familiar rose scent or the sensitizing potential that fragrance has. Rosehip oil is a great source of skin-calming phytosterols plus several fatty acids, primarily linoleic and linolenic acids. Both of these acids help protect and replenish skin’s vital barrier. Rosehip seed oil naturally contains vitamin C, but much of this vitamin is destroyed during processing. Rosehip oil benefits all skin types, but is especially good for dry, sensitive, devitalized skin. You’ll see smoother, softer skin (sensing a pattern here? ), along with fewer signs of sensitivity. This non-fragrant oil is derived from the leaves of the olive plant. Although primarily used as a cooking oil, refined olive oil is found in many skincare products, too. Olive oil is rich in three key fatty acids for skin: oleic, palmitic, and linoleic. Oleic acid is the main fatty acid in the oil, and because its monounsaturated, olive oil maintains a fluid smoothness that spreads easily over skin, helping to prevent moisture loss. Olive oil also delivers antioxidant vitamin E to skin. Olive oil is best for normal to dry skin. Despite its monounsaturated nature, it isn’t as light as some other plant oils, so those with oily skin will typically find it feels too greasy. Olive oil revives skin’s barrier so it becomes less dry and more radiant. Meanwhile, the vitamin E and other antioxidants in olive oil help offset the visible effects of pollution and soften signs of sun damage. You’ll find olive oil in many Paula’s Choice Skincare products, but we’re especially proud of our SKIN RECOVERY Super Antioxidant Concentrate Serum and RADIANCE Renewal Mask. Argan oil is a non-fragrant oil expressed from the kernels of nuts that grow on argan trees. This oil is often touted as being miraculous for skin and hair, but, in truth, it’s just one more beneficial plant oil—not the best oil out there. Argan oil’s fluid yet emollient texture places it between heavier saturated oils like coconut and lighter oils like grape seed. It contains several beneficial lipids and fatty acids for skin, including oleic, palmitic, and linoleic acids. Like olive oil, it’s a good source of vitamin E.
Argan oil can be used by all skin types, but will be most helpful and aesthetically pleasing to those with dry, very dry, and dehydrated skin. You can expect smooth, radiant skin that has a lush softness and long-lasting suppleness—in all honesty, the benefits aren’t much different from those of most of the other oils on this list. Chia seed oil comes from the tiny seeds of the chia plant. It’s primarily known as a nutritious food, but it has numerous benefits for skin, too. Chia oil delivers omega-3 fatty acids to skin along with phenolic acids and isoflavones, two potent sources of antioxidants. The omega-3 oils calm and hydrate while the antioxidants visibly reduce signs of aging and stress, all without a heavy, “coated” feel. Chia oil also contains proteins that can help bind moisture to skin. Chia seed oil is great for all skin types, even blemish-prone or reddened skin. Given the calming nature of the omega-3 fatty acids, you should see a more unified skin tone that becomes less reactive to external assaults. And, of course, your skin will feel softer and smoother, and look more vibrant. You’ll find chia seed oil, along with other omega-3 fatty acids, in our Omega+ Complex Serum and Omega+ Complex Moisturizer. Evening primrose oil is obtained from the seeds of a flowering plant. It has a fluid, silky texture thanks to a high concentration of the omega-6 fatty acid gamma-linolenic acid (GLA). The omega-6 fatty acid in evening primrose, plus other fatty acids and a range of antioxidants led by vitamin E, work to balance skin’s reactive tendencies, calming its surface to reveal a smooth, even, and younger appearance. Evening primrose oil is great for all skin types, but especially good if your skin is showing signs of aging and if you’re struggling with sensitivity. In a word—calm. Your skin will take to evening primrose oil’s GLA content and, in seemingly no time, begin to look and feel more like normal skin. We love evening primrose oil and added it to our SKIN RECOVERY Enriched Calming Toner, SKIN RECOVERY Replenishing Moisturizer, and Moisture Renewal Oil Booster.